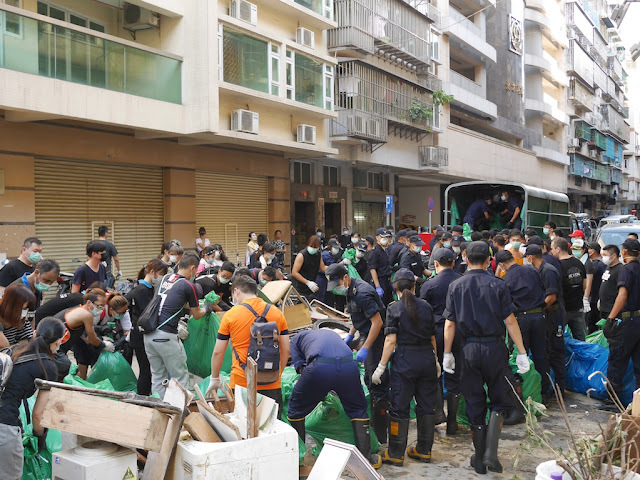 Typhoon Hato not only caused significant damage in Zhuhai but in neighboring Macau as well. 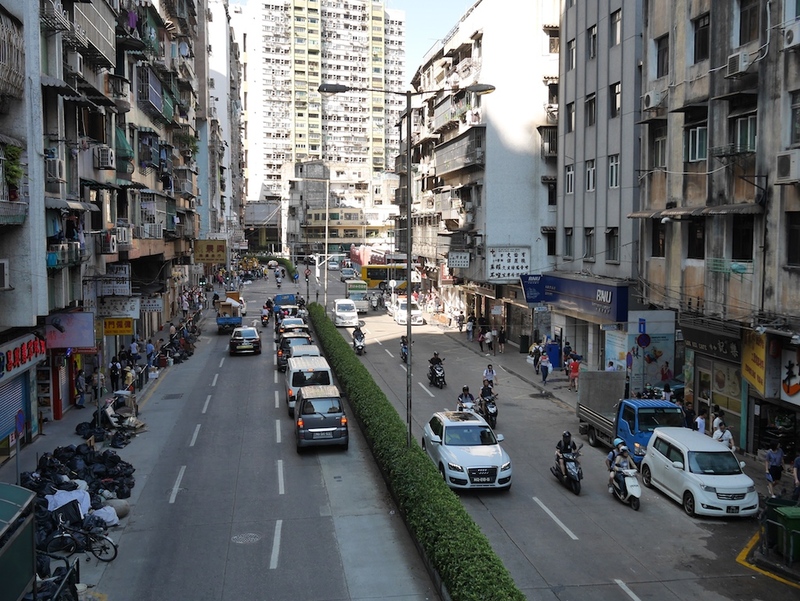 Three days after the storm hit I crossed the land border which separates the cities to spend some time in Macau. 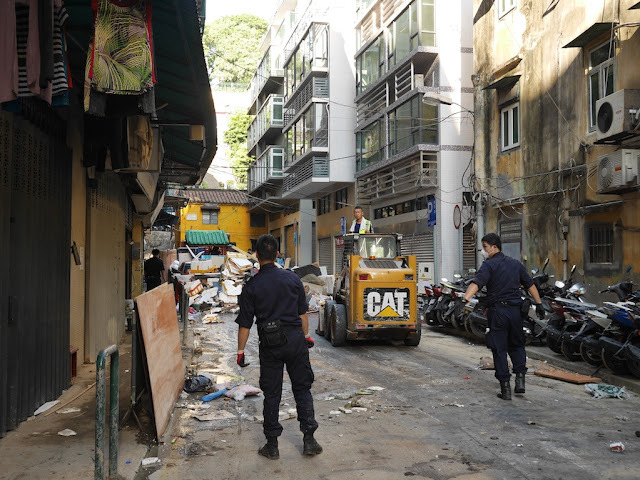 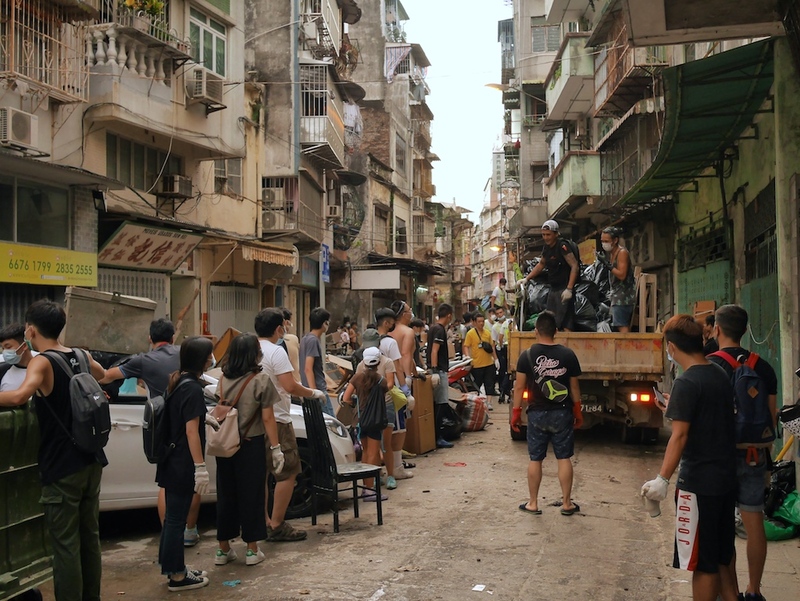 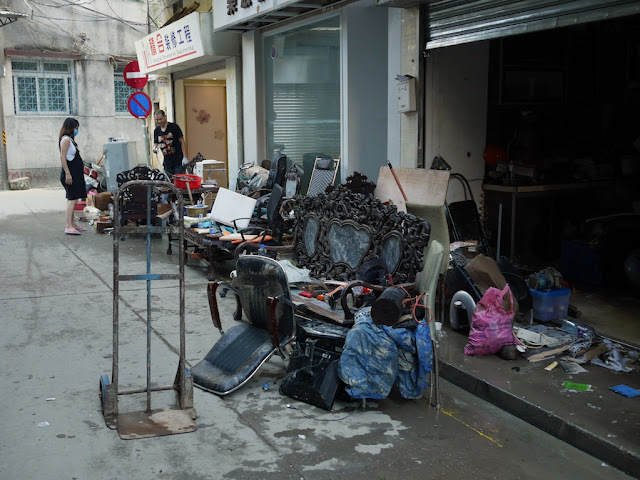 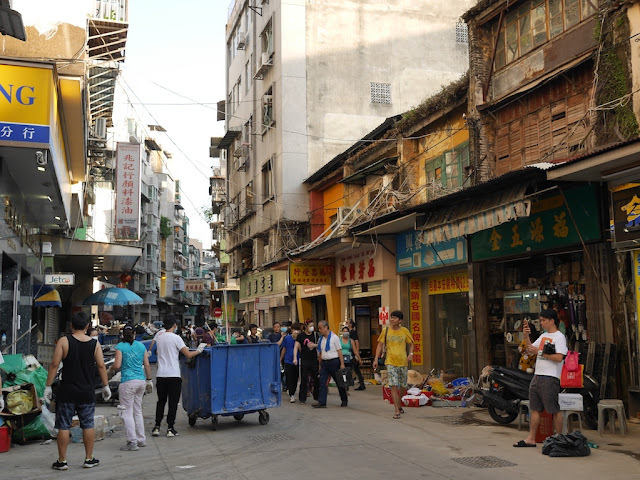 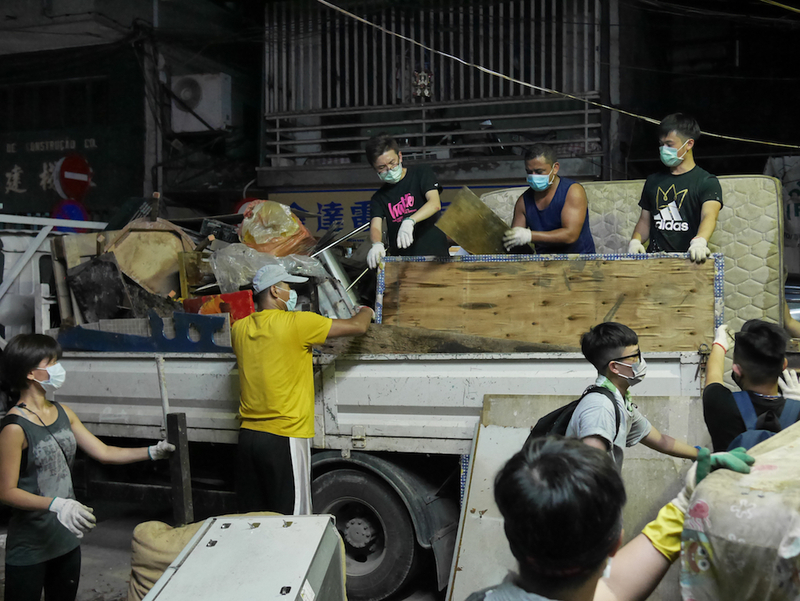 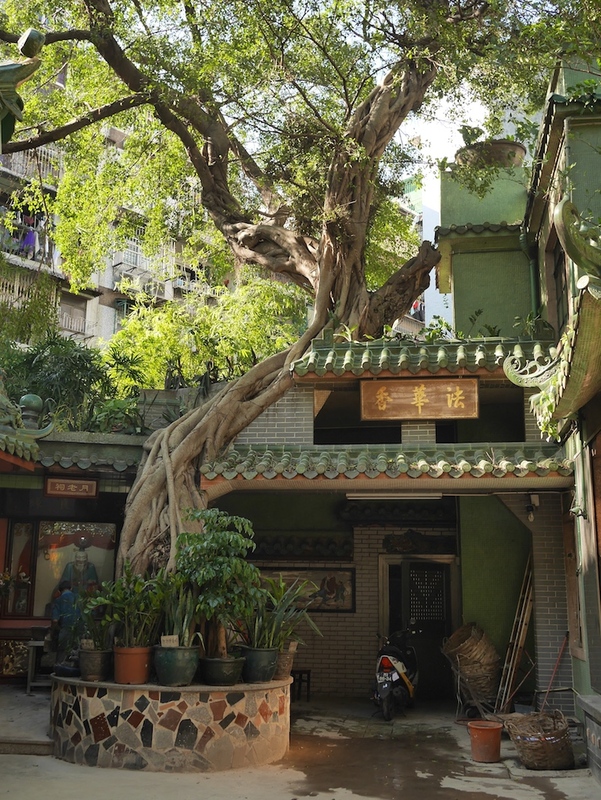 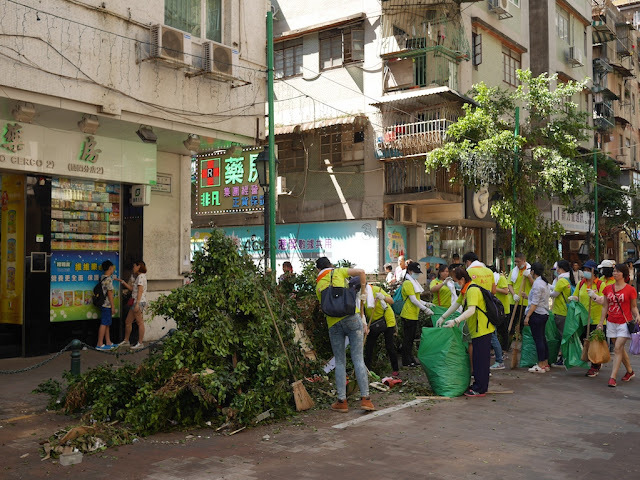 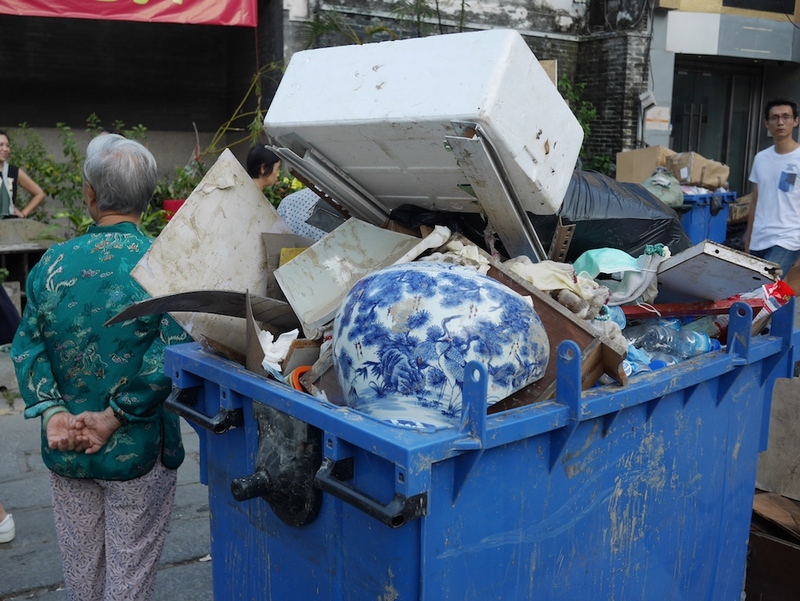 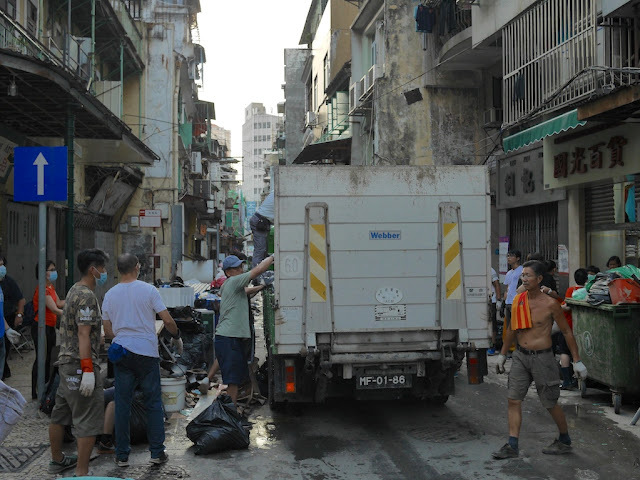 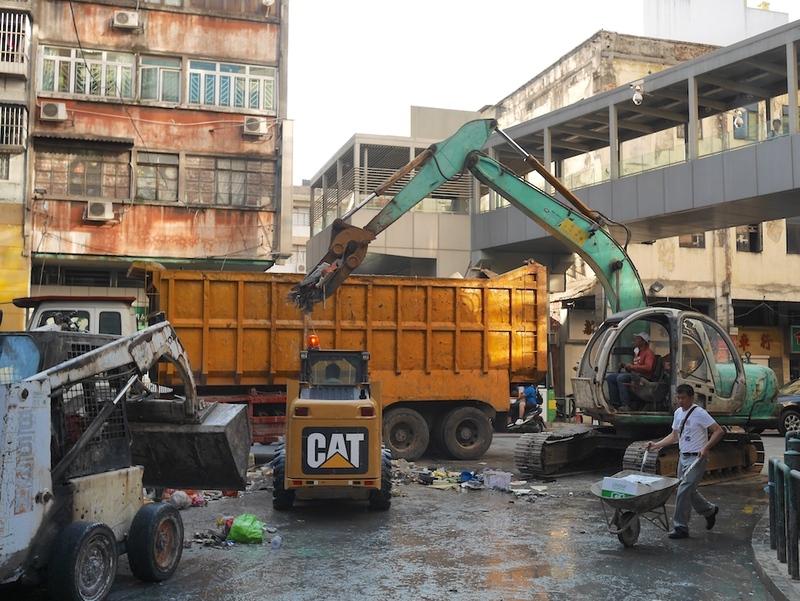 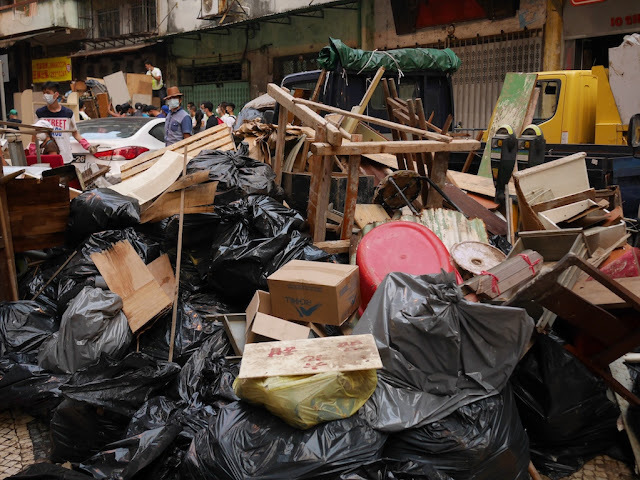 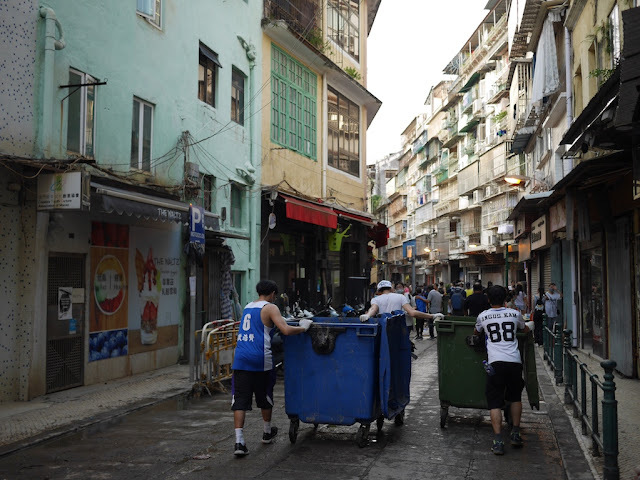 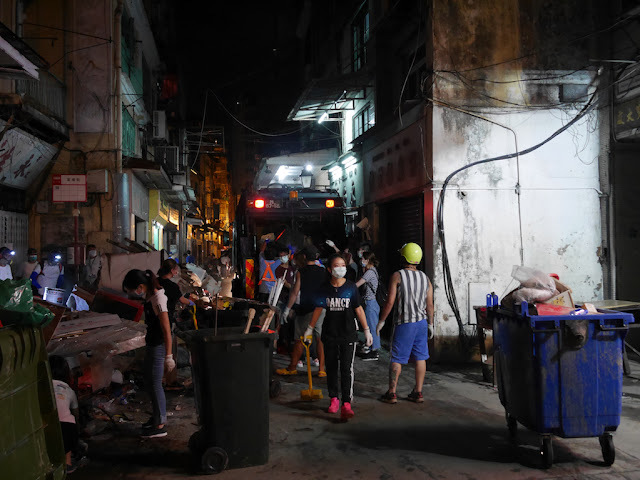 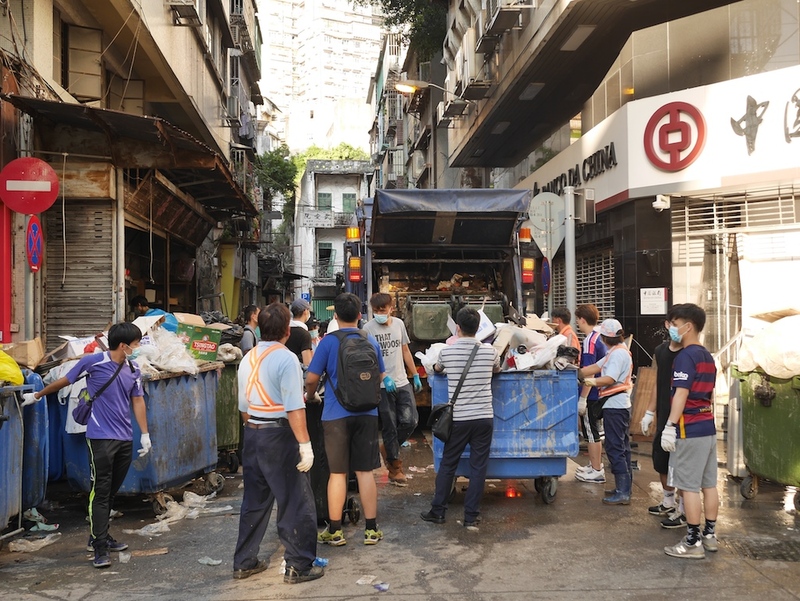 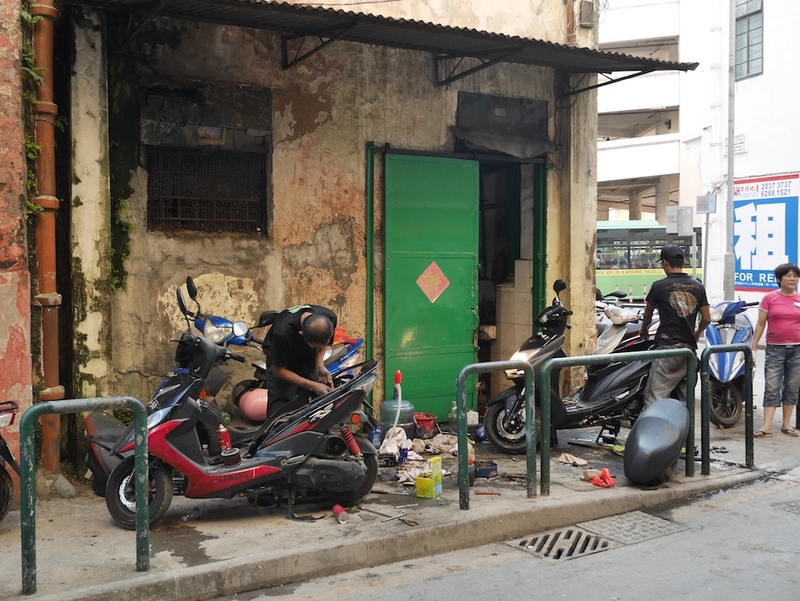 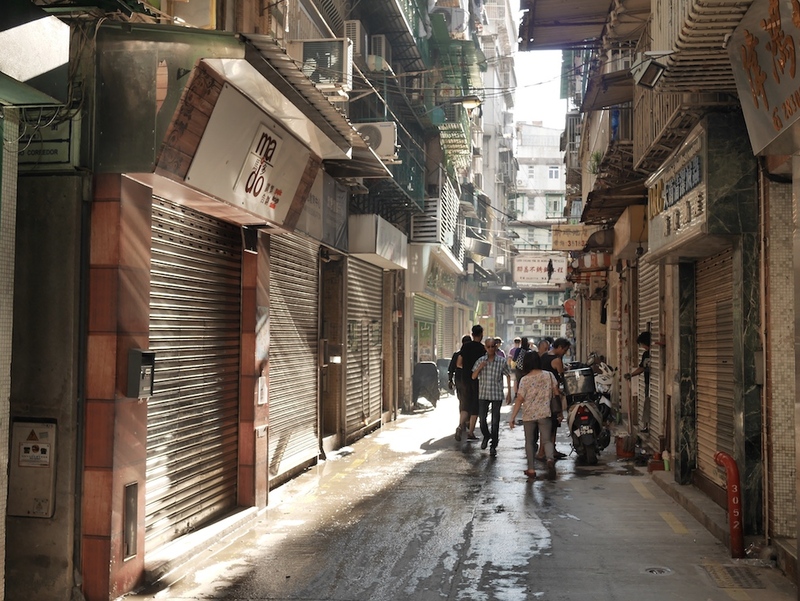 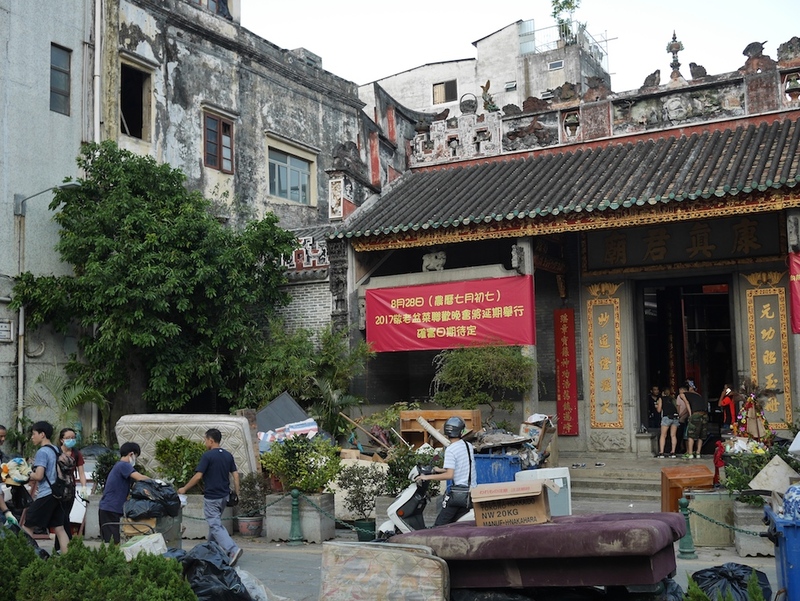 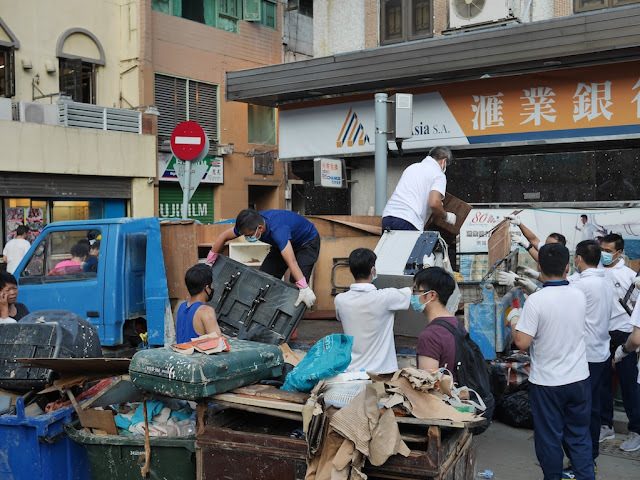 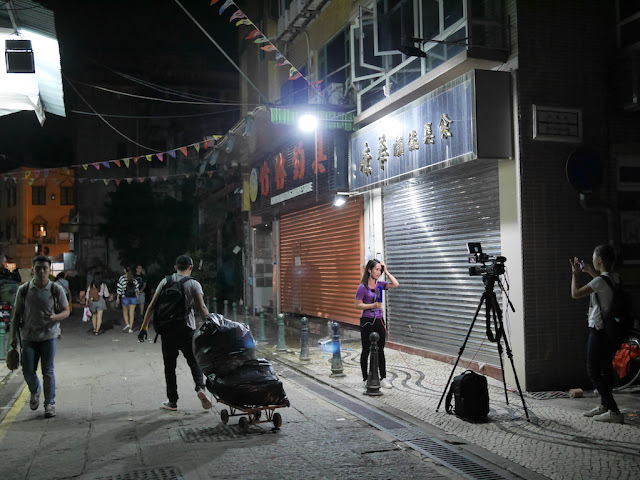 I had just learned electricity had finally been restored to most of Macau, and I assumed enough debris would have been removed that walking through the dense city would not be problematic. Given the relatively limited amount of time I spent in Macau, I won't be doing as extensive of an overview of the the typhoon's impact there. Instead, I will simply share some of what I saw that afternoon and evening in the city, which admittedly was much more than I had expected. After I passed through Portas do Cerco, the immigration checkpoint on the Macau side of the border, I saw one of a few downed trees still around at the pedestrian street on Istmo de Ferreira do Amaral. 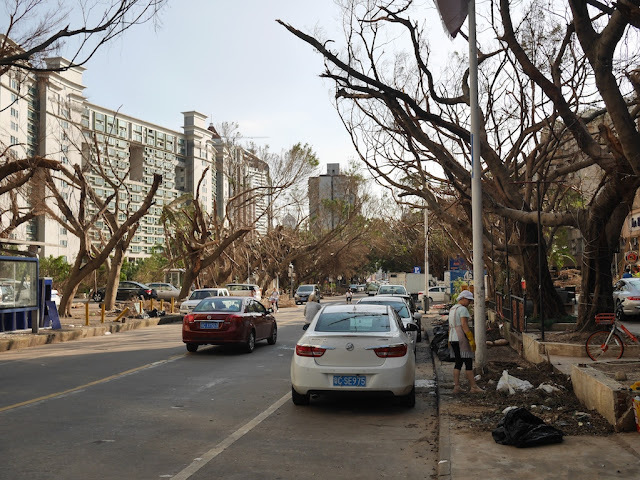 But later I was relieved to see that the large trees at the Chuk Lam Temple (竹林寺) all remained standing. 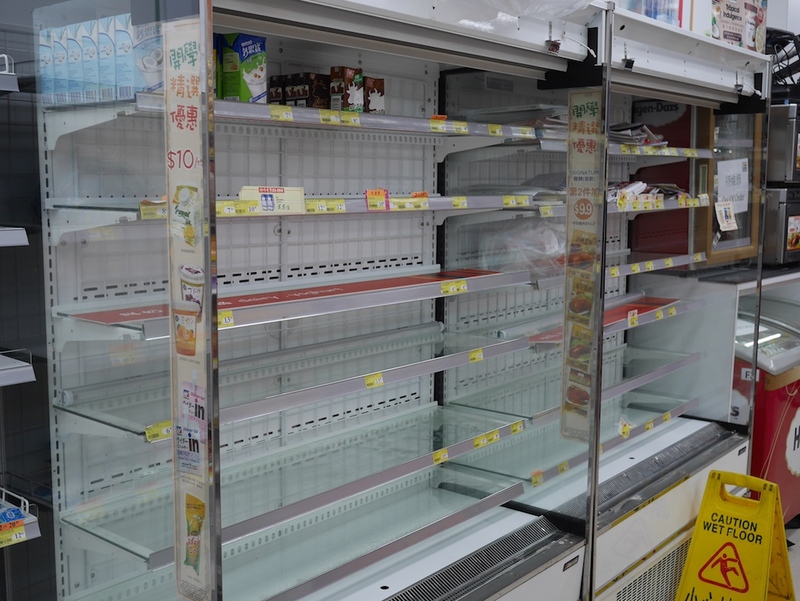 Like several groceries stores I saw, the several 7-Elevens, common in Macau, I stopped by all had mostly empty shelves where items such as milk and and fresh juice were usually kept cool. 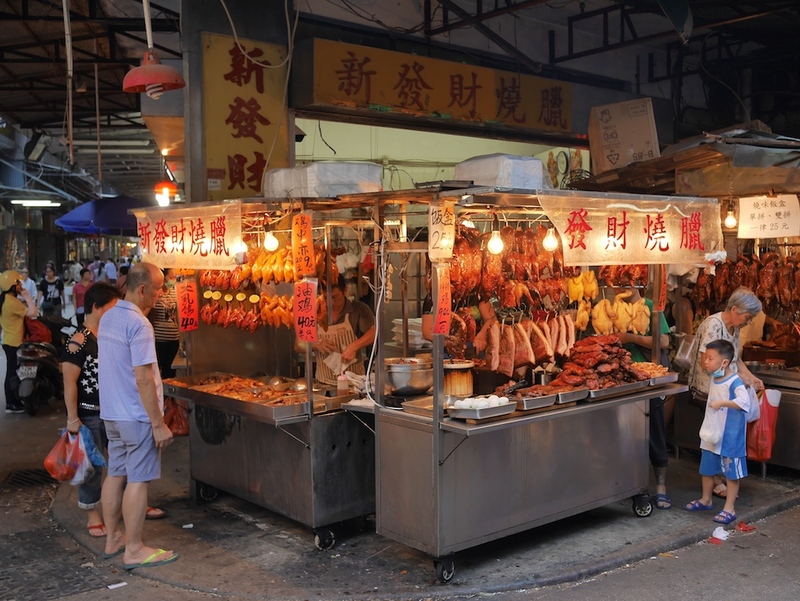 But at a street wet market in the Three Lamps District, along with vegetables and other foods, I saw the usually full selection of roasted meats. One of the more notable impacts of the storm could be seen on Avenida do Almirante Lacerda Santo Antonio where, unlike the any of the areas I had seen in Gongbei, Zhuhai, many stores and other businesses still remained closed. 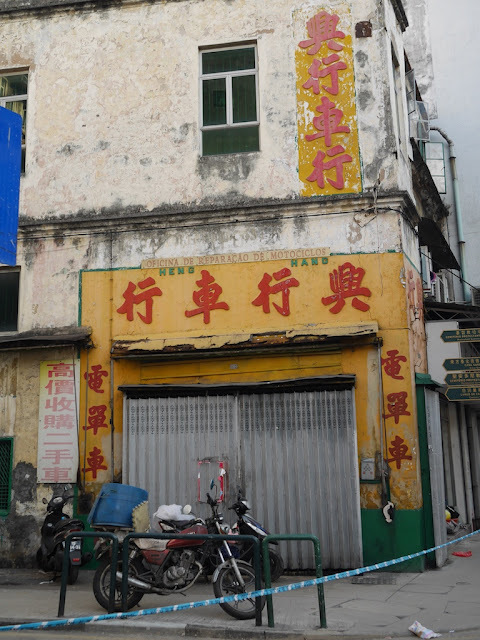 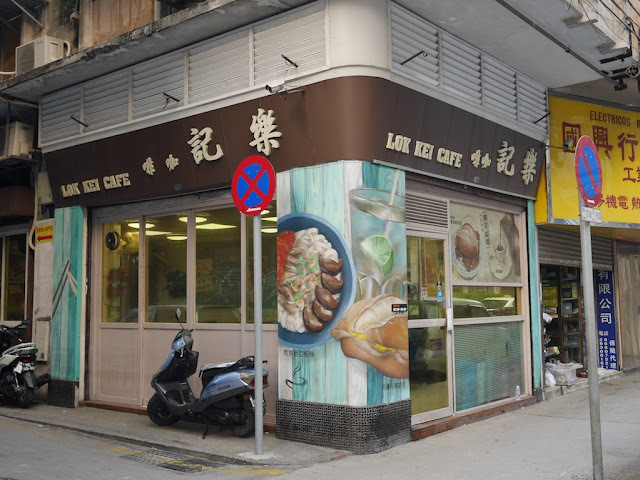 The Lok Kei Cafe, part of what had brought me to the street, was fortunately open, and I enjoyed an appropriate local-style afternoon snack there: a pork chop bun. While there I learned they had just reopened that day and the water had reached the countertops during the storm. 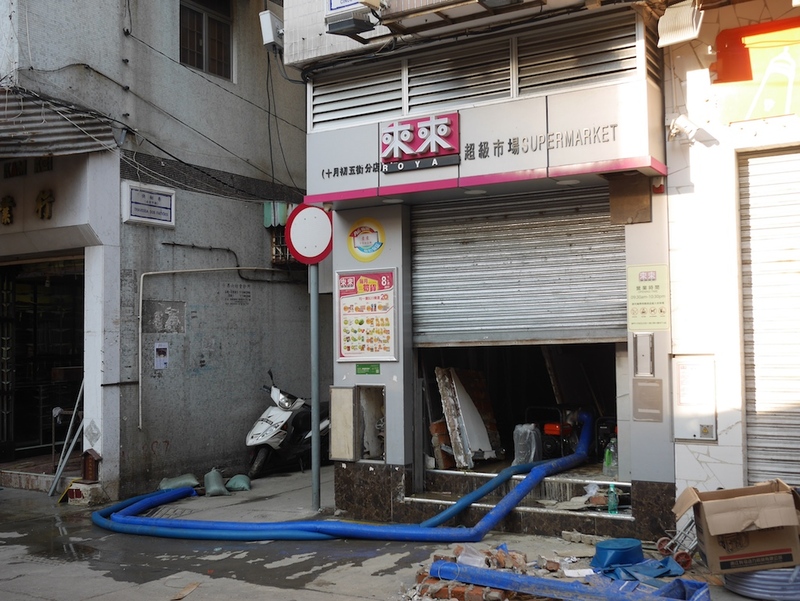 Not only did that explain the many stores at the street level which remained closed, but it also made me think of a nearby below-ground grocery I had been to last year. The story of the flooding also likely helped explain the booming business at one place I later passed not far away: a repair shop for electric vehicles. 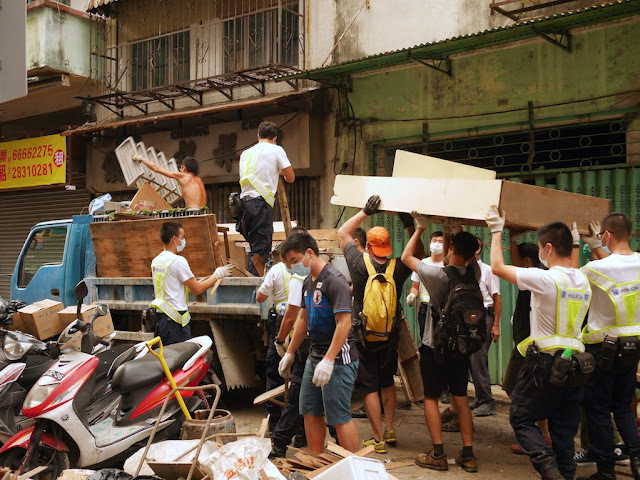 What stood out most that day, though, was the large number of volunteers, police, sanitation crews, and other people participating in a massive cleanup effort due to damage from the extensive flooding. 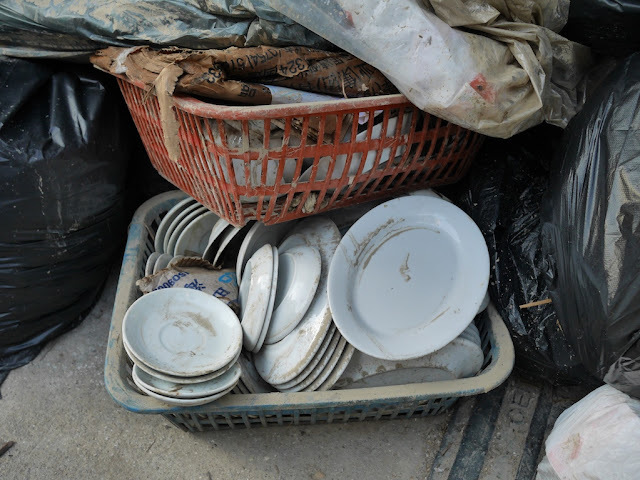 The immense amount of disposed items was striking as well. 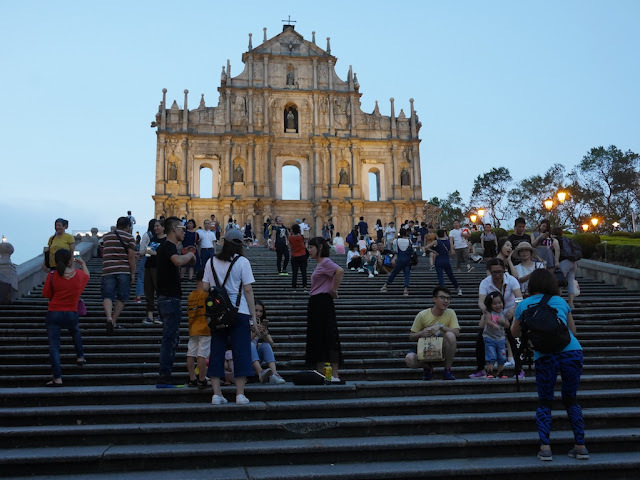 The following series of photos which conclude this post were taken from the late afternoon until evening on the western side of the Macau Peninsula. 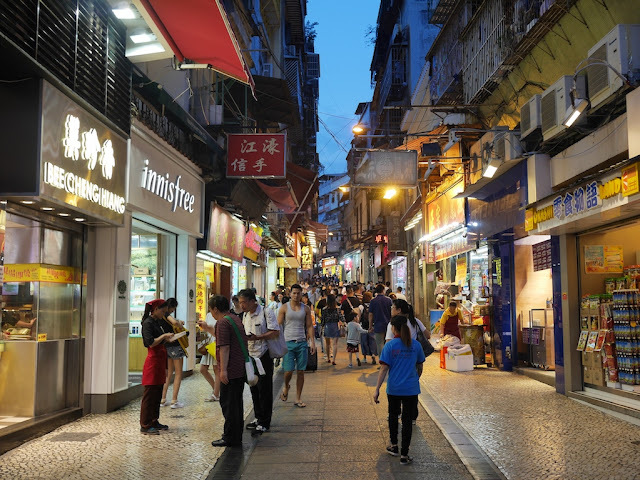 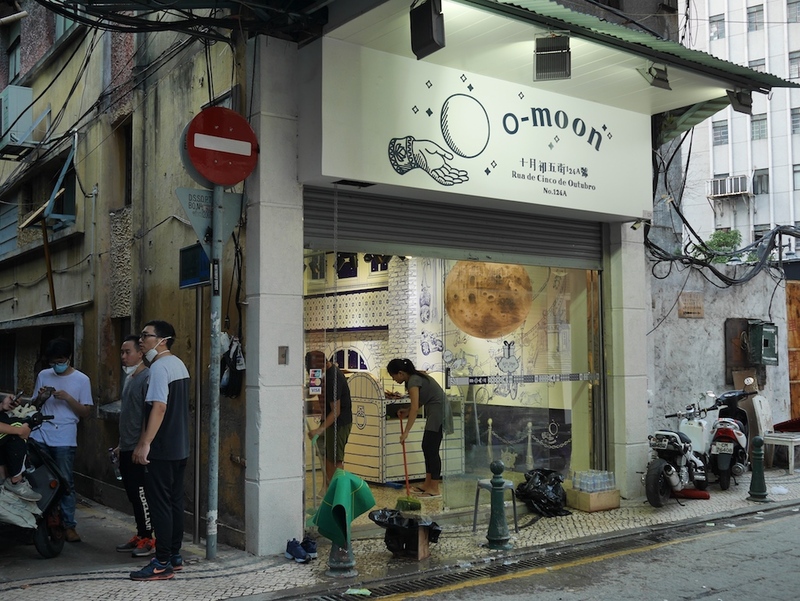 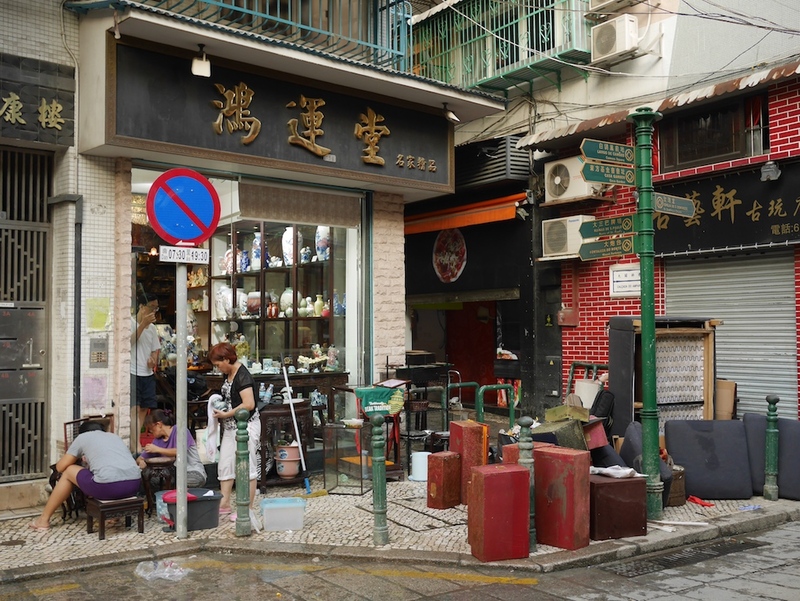 The photos are presented generally in the order they were taken, most with street names in Portuguese — one of Macau's official languages due to its past as a Portuguese colony. 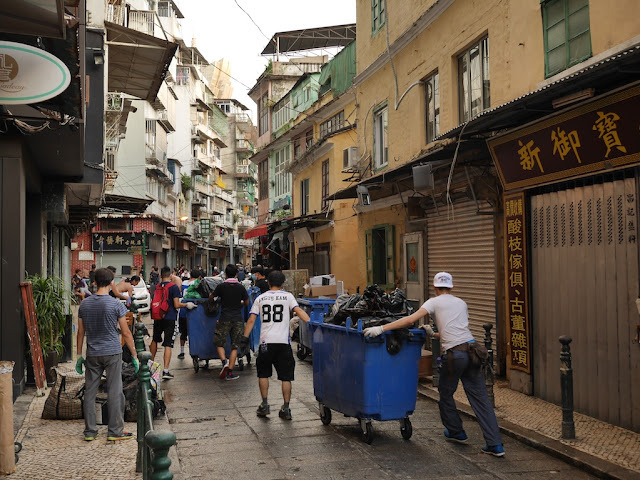 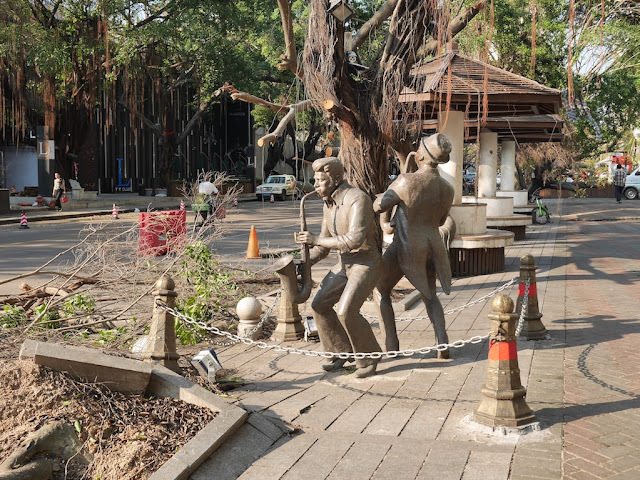 In addition to the extensive cleanup efforts, not all of which meant disposing damaged items, the set also includes two photos from a tourist area. Walking a few steps from some of the other scenes and reaching an area where all appeared mostly normal, except perhaps for smaller than usual crowds on a Saturday night, seemed surreal. 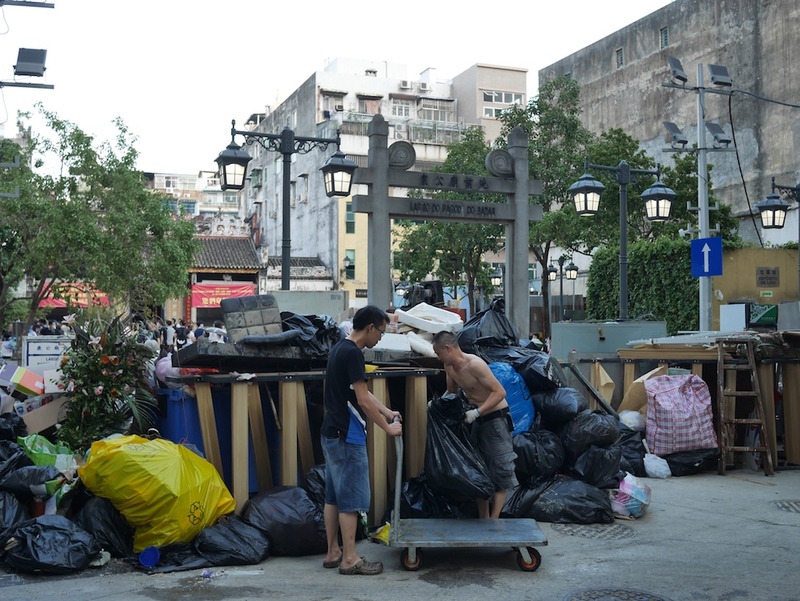 The amount and type of items being disposed nearby seemed surreal as well. 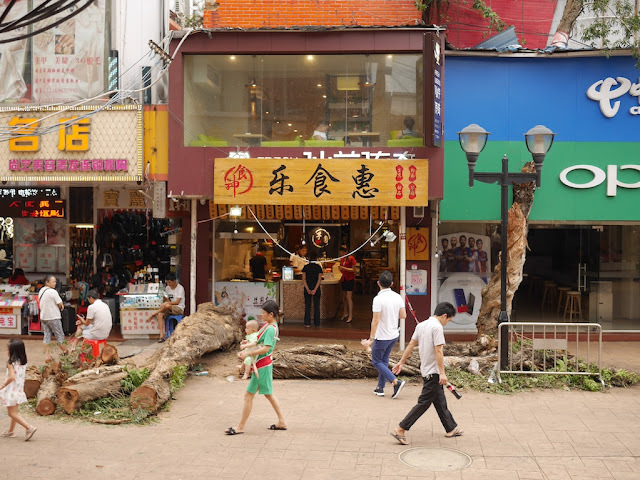 Even now, over a week and half after Typhoon Hato hit Zhuhai, fallen trees and other signs of the destruction left by the storm aren't hard to spot. 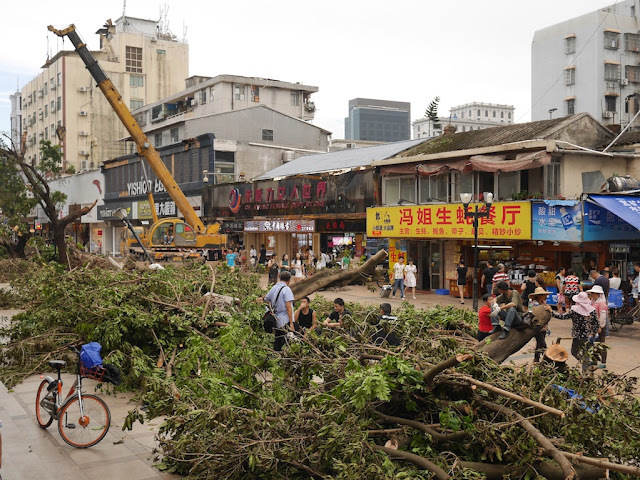 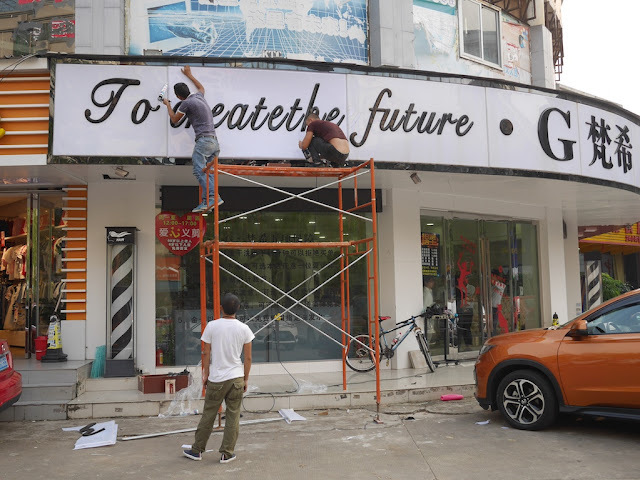 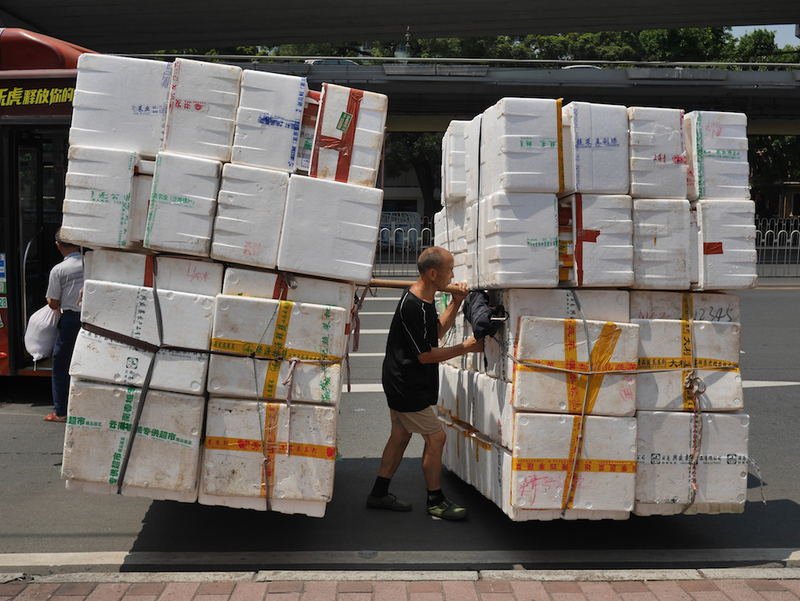 Previous posts of scenes from the Lianhua Road Pedestrian Street, near the waterfront, the Bay Bar Street, Baishi Road, the Midtown complex, and elsewhere in the Gongbei subdistrict covered the day of the storm and the next day as well. 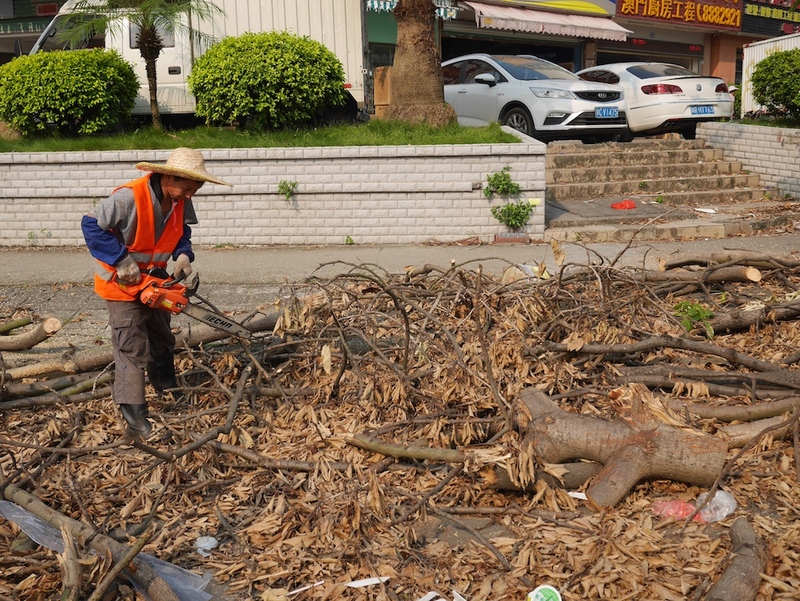 To conclude this series of posts about some of the storm's impact, below are just a few scenes of the later cleanup, repair, and return to everyday life in Gongbei, mostly focused on places featured in the previous posts. Two days after the storm, much debris remained on the Lianhua Road Pedestrian Street. 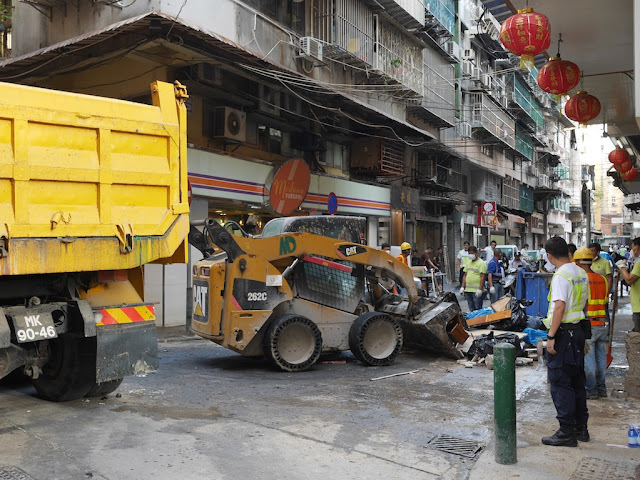 Crews were using heavy machinery. 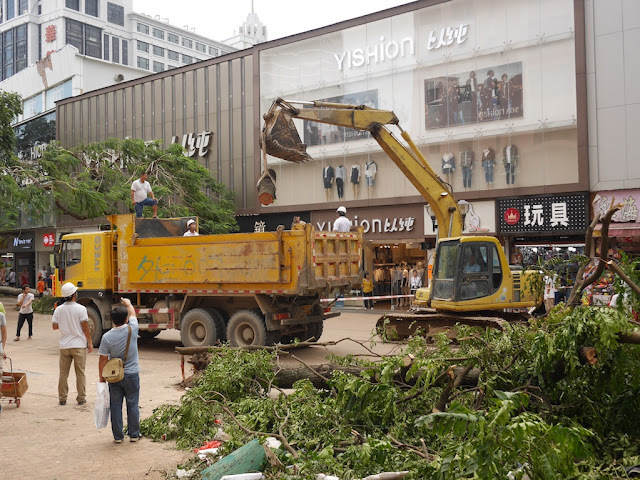 Sometimes, construction equipment was repurposed to suit the task at hand. 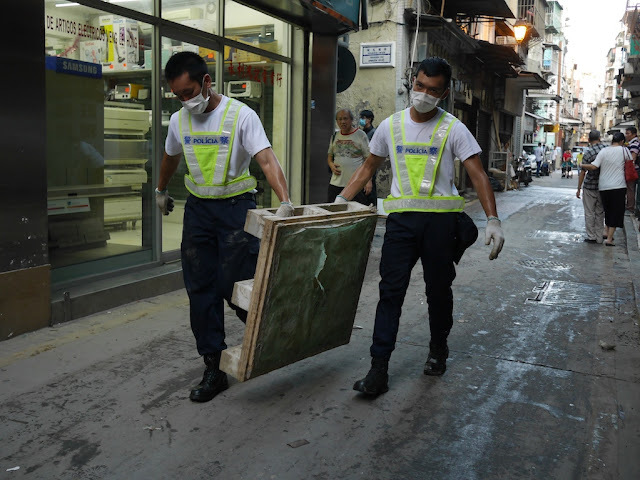 Some of the large pieces of wood raised a question. 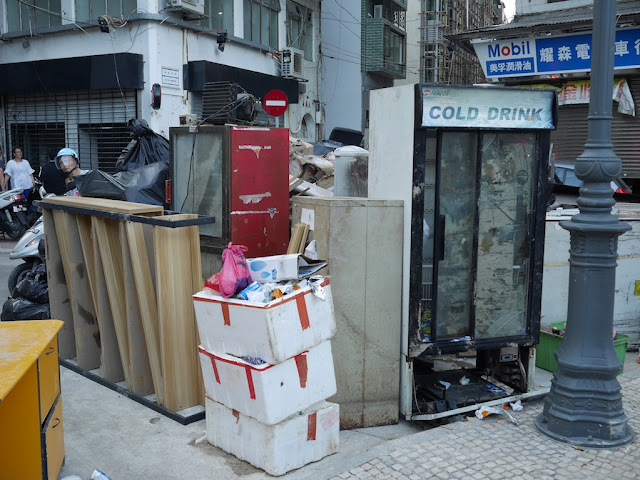 What would be done with it all? 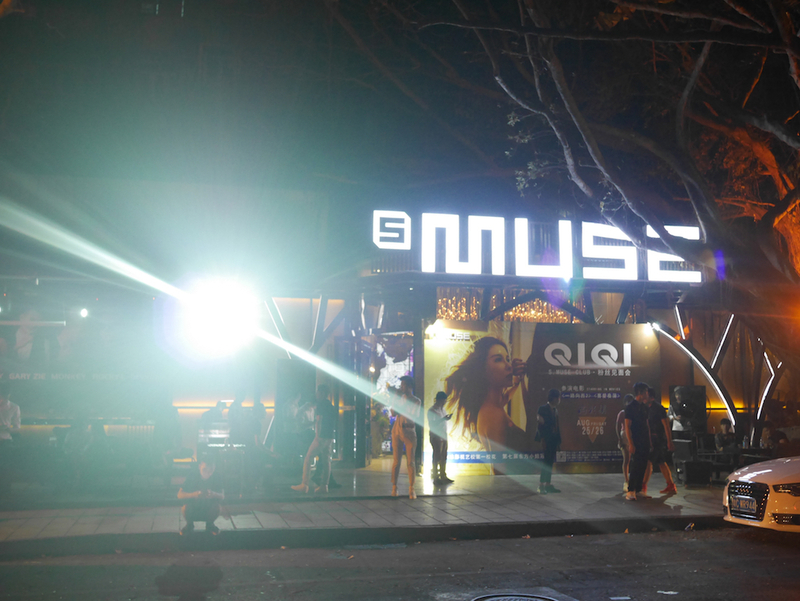 The night life at the Bay Bar Street, which had been severely affected, was returning at some places. 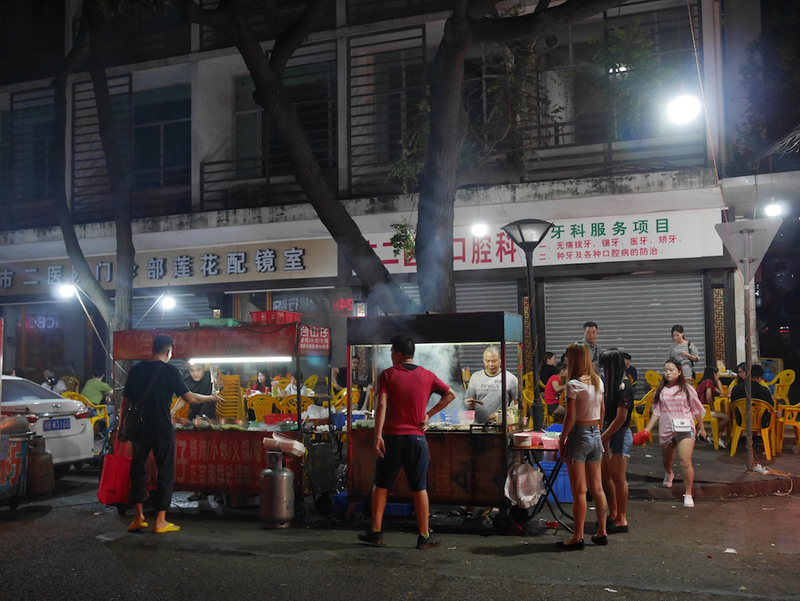 Also that night, on the non-pedestrian portion of Lianhua Road night street food vendors were back in action. 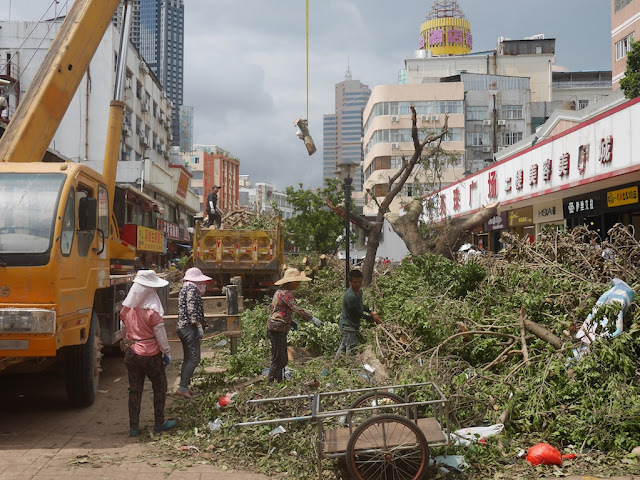 Six days after the storm, although the Bay Bar Street had been mostly cleared of debris, the long lasting damage to the trees that had once provided a thick full covering for the street was readily apparent. 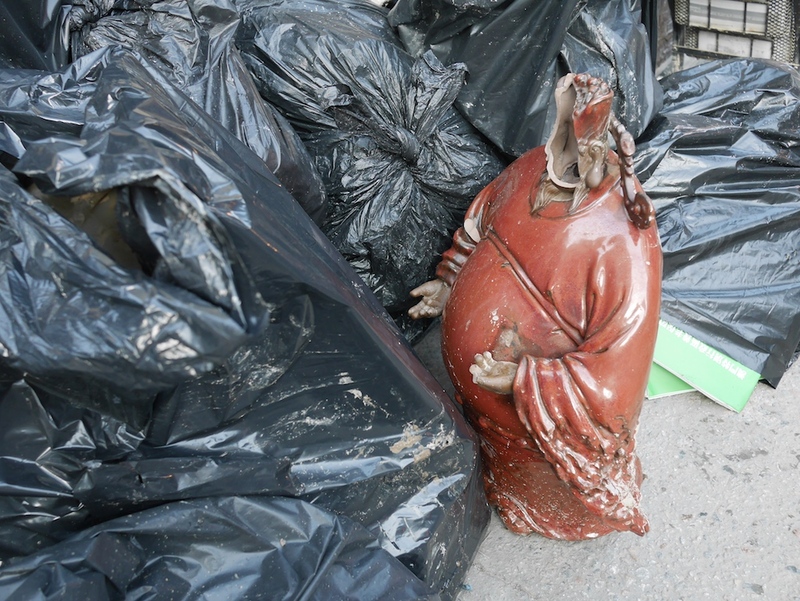 But some things still survived intact. Also, the popular walkway along Qinglu Road was clear, but damage remained. 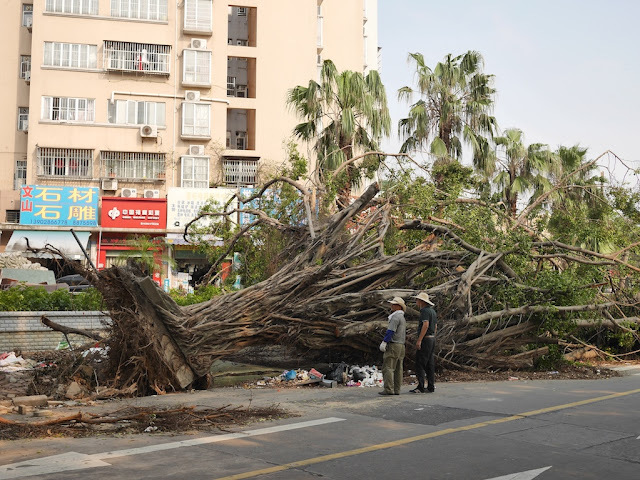 Eight days after the storm Baishi Road no longer had a large fallen tree creating a tunnel over it, but there was still work to be done. 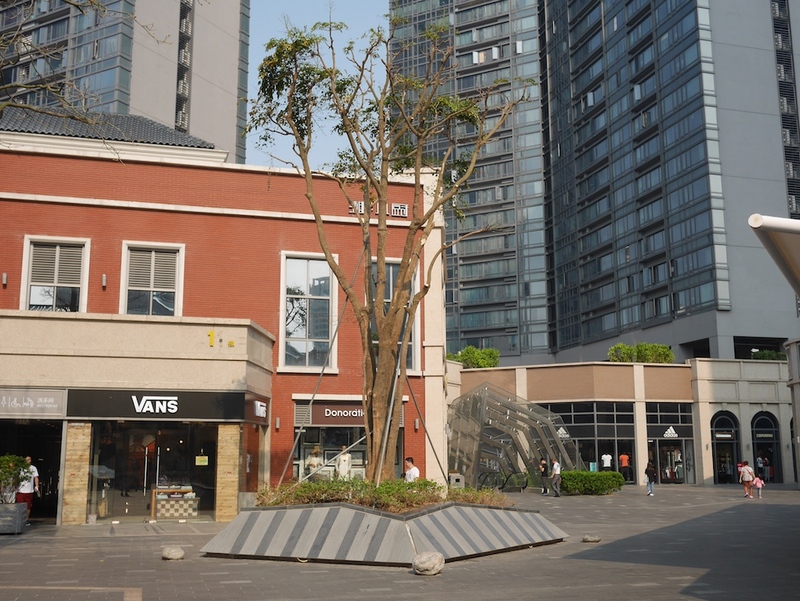 At the Midtown shopping complex, a smaller tree was now in its more usual orientation. Throughout the city, piles of debris from trees still covered bikes lanes or sidewalks. Also visible were the many shiny and apparently new chainsaws in use. 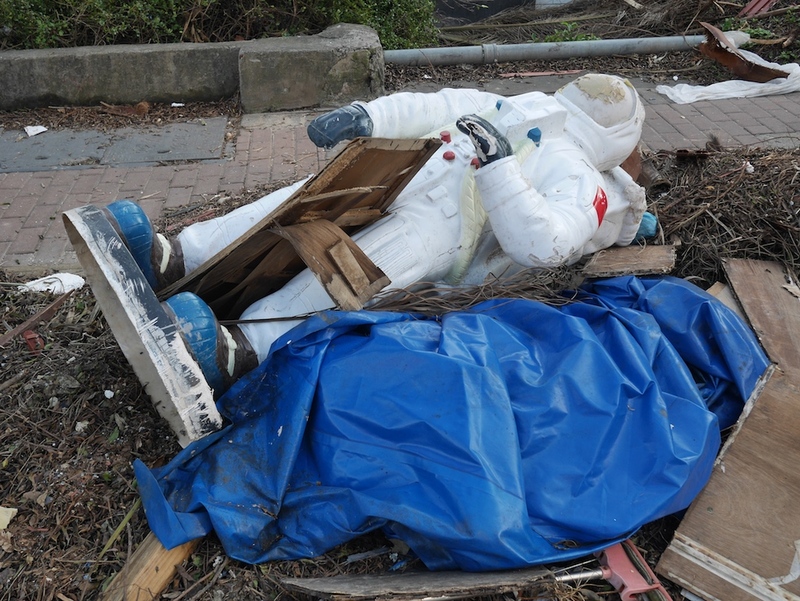 Sometimes the debris included unusual objets, including an astronaut I may have seen before. 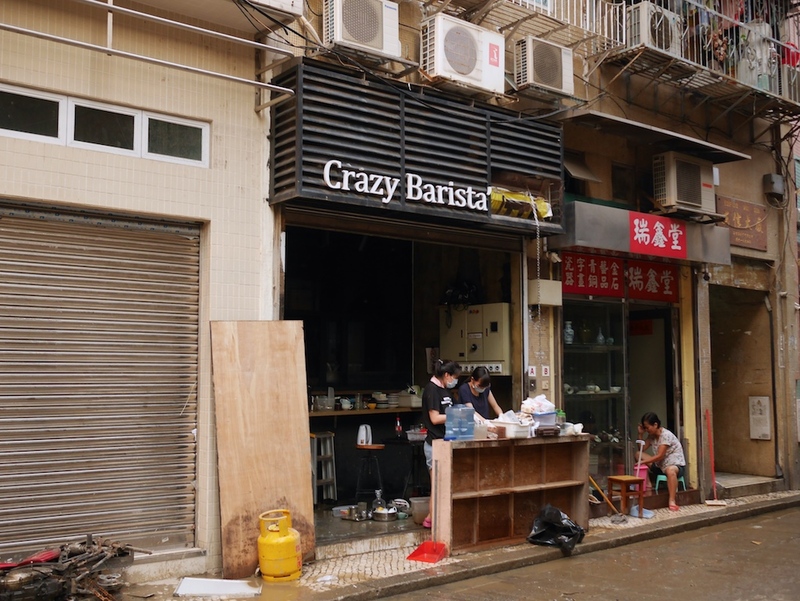 Finally, many storefront signs had been destroyed by the storm. 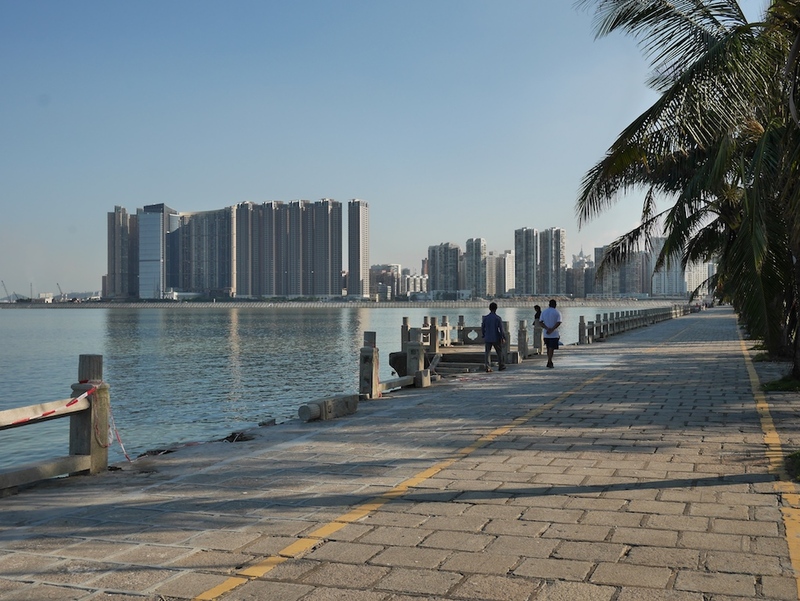 Some were under repair as Zhuhai moved on.